Wedgeview is very suitable for Private Dining and can offer you Great Cuisine. You have a choice of a delicious 3-, 4-, 5- or more courses prepared by our highly skilled and experienced Chef Linda. A private dinner can be served in our dining room or on our covered patio area. Or what do you think of a beautiful romantic private dinner in one of our lounges in front of the fireplace or on the main house balcony with spectacular views of the “Wedge” between Simonsberg and the other Stellenbosch Mountains? Larger groups can be served under our Bedouin tent which can be used in our garden or on our large covered patio outside. Our covered patio can be closed off and has got heaters to keep the area nice and warm. 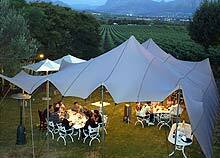 So even on a colder day you can still enjoy your glass of wine or the dinner outside and enjoy the stunning views. We also have a Bedouin tent available (15 by 10 metres) which can be used for functions, weddings, conferences and other events. 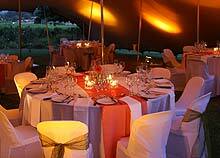 However we also rent it out to third parties who wish to have their event at another venue.